This page is very new, I’ll add more information later but you can begin to use it : download is here. What does this software : Crossvolver is a multiway convolver. 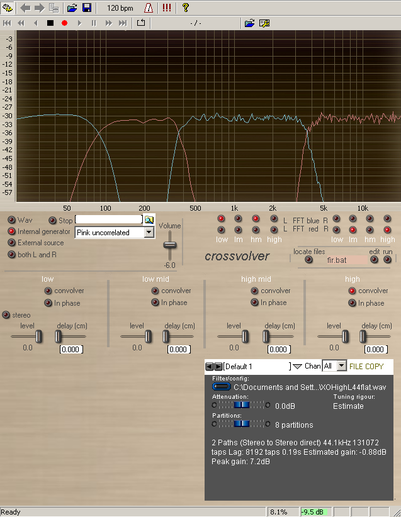 – first calculate and try your crossover, locate files (choose any file of your Crossvolver directory) and run fir.bat. It will open maXO filter calculation, choose precision single-32bit, your sampling frequency, filter type minimal or linear phase (I suggest to begin with linear phase but later, it’s very interesting to compare audible results between both types) and decide of your frequencies and slopes (filter order). Filters are of maximally flat type (butterworth). – I’m planning an evolution of Crossvolver in the next weeks that directly integrates DRC setup so it will be much easier to do the whole setup.